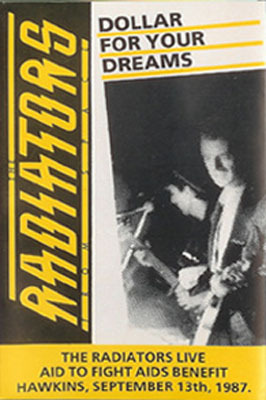 The Radiators – “Dollar For You Dreams” is a limited edition cassette of The Radiators live set at “Aid To Fight Aids”, Hawkins, Dublin, Ireland. Recorded on September 13, 1987. All proceeds went to “Aid To Fight Aids”. Gavin Friday, who played the very first Friday/Seezer live show at the same event, joined the Radiators to sing vocals on Kitty Rickets. The Radiators are: Phil Chevron, Pete Holidai, Mark Mesaray, Jimmy Crash. With Steve Rapid, Keith McDonald, Nick Hurt and Gavin Friday.